In a medium bowl combine the thawed hash browns and butter. Use a potato masher or fork and mash until it is only slightly chunky. Add in the flour, sugar, baking powder, salt, pepper and chopped dill. Mix to combine. Whisk the eggs with the butter milk until blended. Pour the buttermilk/egg mixture into the dry ingredients and stir until combined. Spray your waffle maker with baking spray and preheat according to your waffle iron instruction manual. Once preheated pour the batter into the waffle iron, close and cook until golden and crispy. Serve the waffles with a few strips of bacon and top with a fried egg. Potato waffles for breakfast? Yes, please! Don't consider yourself a waffle connoisseur until you've tried these incredible Potato Dill Waffles for breakfast. Waffles stuffed with bacon and cheddar are a personal favorite. Waffles with corn, sautéed onions and jalapenos are a close second. In fact, I’m pretty sure there isn’t a savory combo that I wouldn’t like in a waffle. Today I have for you a waffle made from hashbrown potatoes, fresh dill and buttermilk. It’s a quick recipe that yields four fluffy waffles, finished off perfectly with crispy slab bacon and a fried egg on top. One great shortcut in making a potato waffle is to use (thawed) frozen hash browns. Hash browns take little to no time to thaw out and are already grated for you. Win! For this recipe you’ll need a heaping cup of thawed hash browns. Then pour in a tablespoon of melted butter. Use a potato masher, fork or your fingers and smash these into a semi chunky-smooth consistency. To the smashed hash browns; add the flour, baking powder, sugar, salt, pepper and chopped fresh dill. Give it a quick stir and scoot it just off to the side. Crack two eggs and slightly whisk them in with the buttermilk. Pour that into the bowl with the potato mixture. Pour the entire thing into your preheated waffle iron. Close the lid and cook until crispy, about 5-8 minutes. You can keep the waffles warm in your oven on the lowest setting while you fry up the bacon and eggs. 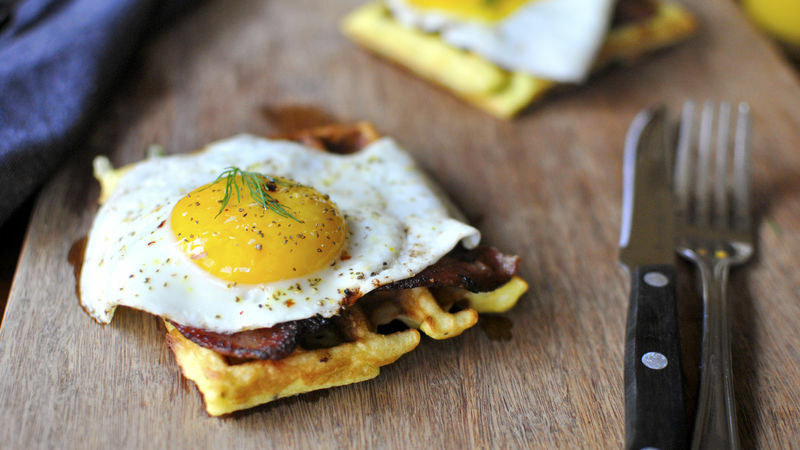 Stack the waffles with a few pieces of crispy bacon and top with a fried egg. You can eat these with a fork and knife – or pick it up and get your hand a little messy for the ultimate handheld breakfast!